Two British men in their 20s were killed on Friday morning when their car veered off Austria’s highest mountain pass during an illegal race, police said. 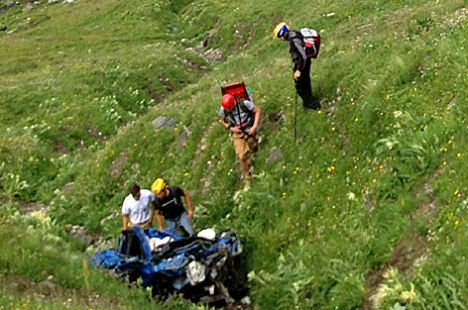 The accident happened close to the highest point of the 2,504-metre (8,215-feet) Grossglockner alpine pass, officials added. The men, aged 22 and 25, were driving a Seat and had been racing against a Porsche when their vehicle suddenly skidded to the right, broke through a crash barrier and plummeted 300 metres. Helicopters were sent to the crash site to help recover the bodies. Police told the Austria Press Agency that the driver of the Porsche, who had fled the scene, turned up at a local police station later on Friday morning. The scenic Grossglockner road leads from the town of Bruck, near Salzburg, to Austria’s highest mountain, the 3,798-metre Grossglockner. The 48-kilometre (30-mile) route is renowned for its many treacherous bends.